In spite of increasing evidence of the many benefits of ‘nature’s contributions to people’, ecosystem degradation and loss of biodiversity still continue on a large scale. An important reason is that money spent on nature conservation, landscape restoration and sustainable land management is still seen as a cost and not as an investment with a high return in benefits: ecological, social and economic. These guidelines should help to analyse and quantify these benefits in a standardised, transparent, and eventually certified way. 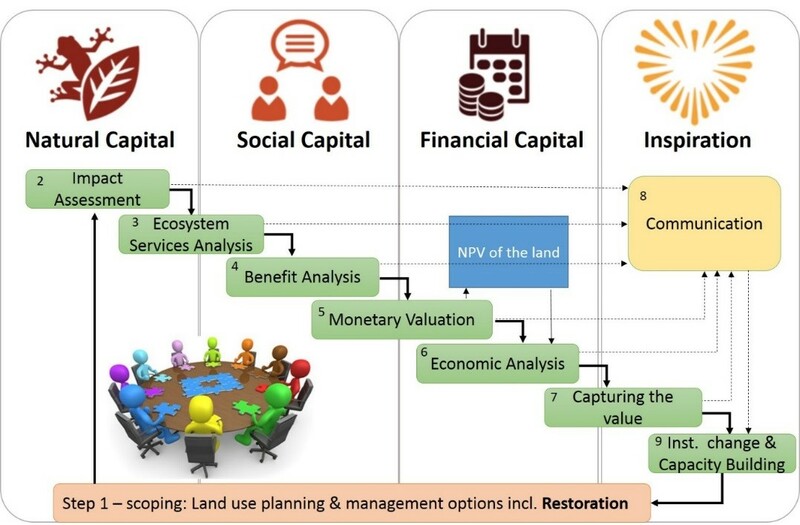 The Guidelines consist of 9 steps that together contribute to the so called “4 Returns” (ref: Commonland) of investing in nature conservation, ecosystem restoration and sustainable landscape management (see fig. 1). The nine steps shown in the framework figure are described in detail in the draft ESP Guidelines document. To implement each step in the Guidelines various tools are available. Easy access to supporting databases on ecosystem services indicators, values, case studies, applications of tools, etc. is essential. On this website you can find an overview of existing databases. Please share with us any databases missing from this list by sending an email to [email protected]. Your input on the draft document ‘Guidelines for Integrated Ecosystem Services Assessment’ will be much appreciated. If you are interested to contribute, please contact Rudolf de Groot ([email protected]) to request the draft document. If you have an active ESP membership account, you can simply access the document on this page, along with further instructions regarding submitting your feedback. We aim to develop each of the 9 steps further into specific modules for research and training purposes. This requires small but dedicated teams of lead and contributing authors with expertise on impact assessment, ecosystem service analysis, benefit analysis, monetary and economic valuation, financing mechanisms, institutional change and communication. If you want to join one of those teams, please contact Rudolf de Groot ([email protected]). We would also appreciate your input on the description of the supporting tools (factsheets), and send us any missing tools. On this page you can find a link to the factsheets, as well as further instructions on how to contribute. Finaly, please share any case studies on ecosystem service assessment or specific applications of some of the tools. You can do this by sending us an email at [email protected]. We thank you in advance for your contribution to this process! To make sure you don’t miss the updates on this topic, be sure to subscribe to our monthly newsletter.